The youthful nephew of Berry Bros. & Rudd favourite Robert Michel, who is now retired, is taking on something of an eminence grise persona himself these days, running the Syndicate of Cornas with great skill. It helps to have such fine vineyards of course, many of them inherited. The 2011 vintage he views as less tannic but more aromatic than 2010, to his liking in other words, as he often states that aromatic harmony is the key to a great Cornas. The famous Geynale site is located immediately above the village in the Reynards commune, its vines chiselled into unadulterated granite, dating from 1910. Dark fruit and massive, monolithic tannins hold sway and will do so for quite some time. 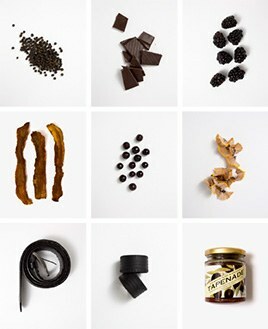 Then the sweet and the savoury will start to do battle. The Wine Advocate - The 2011 Cornas La Geynale (aged 18 months in barrel) offers a wild array of smoked meat, dusty stone, gunflint, pepper and dried herbs to go with loads of black raspberry and blackberry-styled fruit. Full-bodied, rich and with big structure, it has beautiful texture, no hard edges and serious length on the finish. Give it a couple years to round into form and enjoy it through 2031. 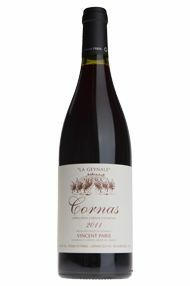 Parker - The 2011 Cornas La Geynale comes from 80-year-old vines planted in the southern end of the appellation. The wine was slightly reduced, making judgment somewhat hazardous. Nevertheless, it is loaded and huge in the mouth with gigantic fruit and colossal extract. Given its richness, there is none of the painful tannins and rusticity that Cornas can sometimes possess. I’ll retaste it next year from bottle and, hopefully, have a better handle on it. Vincent Paris is a child of Cornas and his biodynamically run estate now encompasses around 17-18 acres, from which he fashions three remarkable cuvees, the Granite 30, Granite 60 Vieilles Vignes and an offering from the well-known parcel of La Geynale. Paris has enjoyed three consecutive remarkable vintages (as have a number of the finest Cornas producers), 2009, 2010 and 2011. The Granite 30 generally comes from the lower hillside parcels of a lieu-dit called Mazards with soils that are mostly decomposed granite. These are also his youngest vines. You would never know that by tasting what Paris has produced in 2011 and 2010. The Granite 60 comes from three separate parcels of a lieu-dit called Sauman, which is opposite of another famous lieu-dit called Reynard. As Paris says, this is an area that gives more body as well as freshness than other terroirs in Cornas. Vines planted in these three parcels are 20, 60 and 100 years of age.